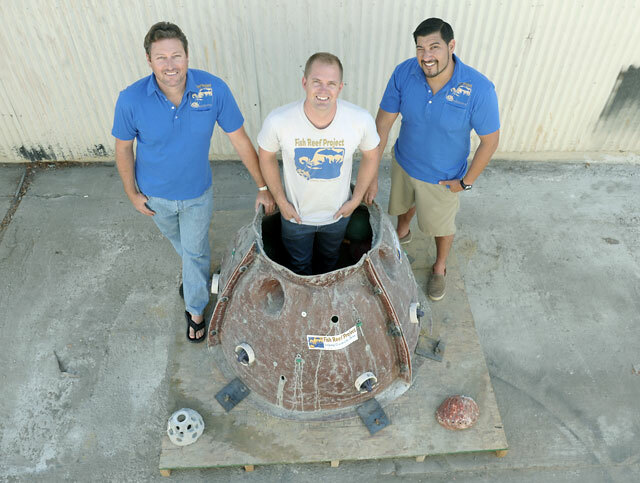 <strong>REEF BUILDERS ‘R’ US:</strong> (from left) Chris Goldblatt, Lonnie Nelson, and Tony Huerta pose with the form used to make concrete “reef balls,” a key ingredient in the artificial reef that their group, Fish Reef Project, hopes to build offshore of Santa Barbara. Roughly five weeks ago, with the hope of jump-starting a plan to install a fish ​— ​and fishermen ​— ​friendly artificial reef offshore of Santa Barbara, Chris Goldblatt, himself a former commercial fisherman and outspoken critic of the recently imposed, state-sanctioned marine protected areas in Southern California, and some colleagues dropped two 1,300-pound hollow concrete igloos into the ocean offshore of Hendry’s Beach. The concept of an artificial reef is nothing new. In fact, not only did the California Department of Fish and Game have an actual reefing program for much of the second half of the 20th century (it was eventually defunded in 1989), but, as Goldblatt is quick to point out, there are artificial reefs currently off the shores of more than 70 countries, many of which use the reef ball technique. There are also success stories right here in California such as the SONGS (San Onofre Nuclear Generating Station) reef just south of San Clemente, built by Edison as a form of mitigation related to the nearby power plant. Other concerns held by groups such as the Environmental Defense Center and Santa Barbara Channelkeeper include the potential for an inappropriately sited artificial reef to cause a fish population sink or crash at nearby naturally occurring habitats or the luring of wildlife away from the safe haven of existing marine protected areas to unrestricted waters. Given these worries, when word spread late last month that Goldblatt had already installed a pair of reef balls without really reaching out to the nearby environmental community or the various regulatory agencies, not only did the collective neckhairs of Santa Barbara’s various ocean watchdog groups stand straight up, but the Coastal Commission’s enforcement wing also opened up an official investigation and has since declared, via a written notice, that the two balls meet the definition of development under the Coastal Act and now must seek after-the-fact approval or be removed. Adding to the controversy is the fact the balls were deployed as part of an existing aquaculture operation off of Hendry’s owned by Santa Barbara’s Justin Mezey. For his part, Goldblatt explained that the reef balls were technically plopped down, with Mezey’s permission, as anchors for Mezey’s Blue Revolution mussel and oyster aquaculture research business, the idea being that, by getting a few reef balls in local waters, he would be able to document how quickly they recruit life and thus provide some hard ​— ​albeit small sample size ​— ​evidence of what he hopes to accomplish in the future and boost fundraising efforts. “It was a way to get a few of them down and see how they work,” said Goldblatt of the violating balls. “We weren’t trying to skirt any permitting; we just thought they were within the scope of the existing aquaculture permit.” Unfortunately, according to Coastal Commission staff, not only are the reef balls in need of permits, but Mezey’s entire operation ​— ​around since the mid 1990s under the jurisdiction of the City of Santa Barbara, thanks to the ribbon of Pacific Ocean given to the city to help with annexation of what is now the S.B. airport ​— ​also needs a permit from the Commission and, according to their enforcement staffers, has since been deemed to be in violation of the Coastal Act.